Has Julian Dennison's Deadpool 2 Character Been Revealed? Has Julian Dennison’s Deadpool 2 Character Been Revealed? You’ve seen the trailer and pored over each and every frame; now it’s time to settle in and identify the new mutants of Deadpool 2 – not to be confused with the horror-tinged spinoff that was recently pushed all the way back to August 2nd, 2019 as part of 20th Century Fox’s reshuffling. Aside from Josh Brolin (Avengers: Infinity War) and Zazie Beetz, who we know to be Cable and Domino from previous intel, the newcomers of Deadpool 2 include Julian Dennison of Hunt For the Wilderpeople fame, Shioli Kutsuna, Bill Skarsgård (It: Chapter Two) and Terry Crews. Common logic dictates that Crews has signed on to play the role of Bedlam, a mutant capable of generating a bioelectric field that disrupts mechanical and electrical systems. His powers can also mess with people’s minds – specifically the neurochemistry that controls pain and sleep – but it’s unclear as yet if they’ll come into play. Shioli Kutsuna, meanwhile, is on board as Surge, though there’s still no mention of Skarsgård’s role. Last and certainly not least is Julian Dennison, who broke onto the scene with his frankly hilarious, yet heartfelt performance in Hunt For the Wilderpeople. And we now have reason to believe that his Deadpool 2 character is, in fact, Rusty Collins (AKA Firefist). Word comes to us by way of Revenge of the Fans, whose latest rumor suggests Dennison’s fire-wielding character and Rusty Collins are one and the same, as the mutant holds connections to both The New Mutants and the X-Force – two in-development blockbusters currently gestating at Fox. Couple this with the fact that the time-travelling Cable is on the hunt for Collins (or Thunderbird/Pyro) and it appears Dennison’s newcomer is responsible for some future atrocity. And it’s up to the Merc to save him. 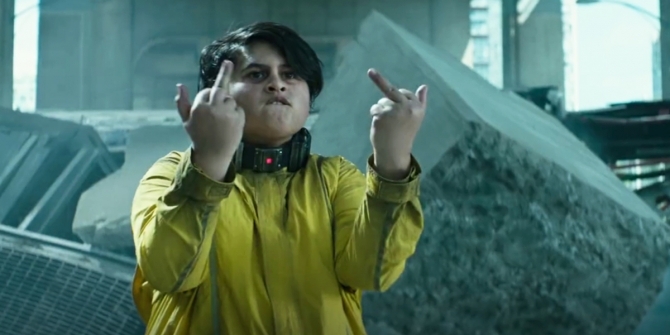 Whatever the case, it’s looking increasingly likely that Julian Dennison’s involvement in the X-Men franchise will span beyond Deadpool 2, what with the X-Force team-up movie already making headway under Drew Goddard. Watch this space for more.